You will love this old fashioned white wedding cake recipe. The charming heart-shaped bride's cake is absolutely delicious and suitable for serving at weddings and on special occasions. Plus, its history makes it a great conversation piece. A heart-shaped bride's cake requires that two cakes be made, one square and one round. Cut the round cake in half and position the halves on two sides of the square cake to make the heart. 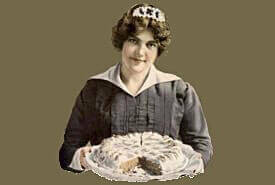 You'll need to double the white wedding cake recipe to make two cakes, unless a heart-shaped baking pan is used. 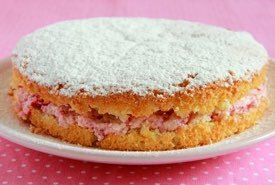 When baked in a round pan, it's the perfect cake for any party or get-together where you've been asked to bring a cake. People will love it, and you'll feel pride in having made it. Cream 1 cup shortening and 2 cups sugar together well. Sift 5 teaspoons baking powder, 4-1/2 cups flour, and 1/4 teaspoon salt together five times; add alternately a little at a time with 1-1/4 cups sweet milk, and beat thoroughly. Add 8 egg whites which have been beaten stiff, and 1 teaspoon almond extract, and 1-1/2 teaspoons vanilla extract last. Bake in slow oven at 325°F until perfectly firm to the touch, or about 1 hour and 10 minutes. Makes one 9-inch round loaf. Decorate the wedding cake using traditional white icing and trim with pink. This dainty bride's cake carries with it an illustrious background. Mrs. Betty Lyles Wilson was a noted domestic chef, the Julia Child of her day. 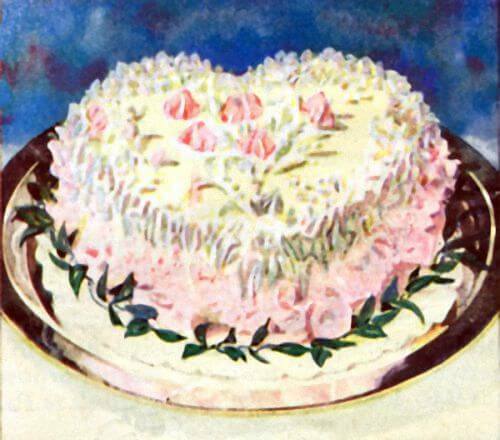 Though unrelated to the Woodrow Wilson family, she adapted a favorite white cake recipe to bake a small heart-shaped bride's cake decorated in pink and white frosting for the White House wedding of President Woodrow Wilson's daughter. Jessie Woodrow Wilson Sayre (1887-1933), a Princeton graduate, was the second daughter of President Woodrow Wilson. 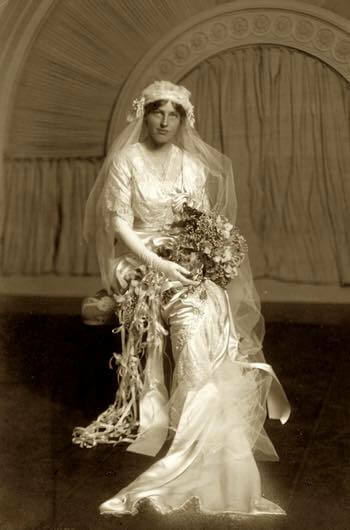 At age 26, she married Francis Bowes Sayre in the famous East Room of the White House on Monday, November 25, 1913. At the time, Woodrow Wilson (1856-1924) was the 28th President of the United States serving from 1913 to 1921. 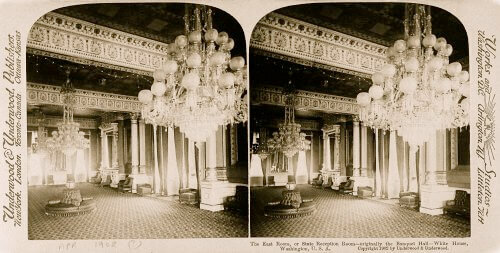 The vintage 3D photo below reveals the opulence of the East Room in the White House as it appeared in 1902. 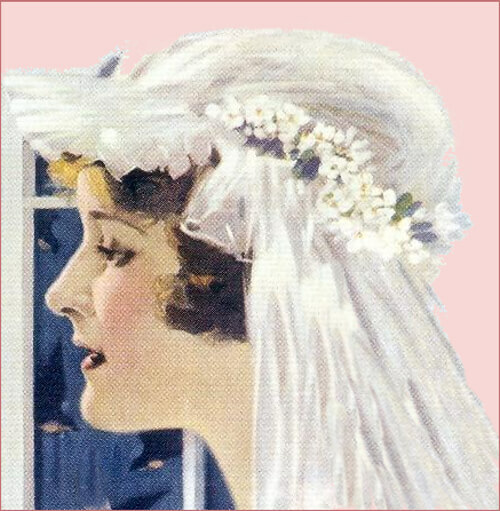 It would likely have looked very similar at the time of Jessie Wilson Sayre's wedding in 1913. 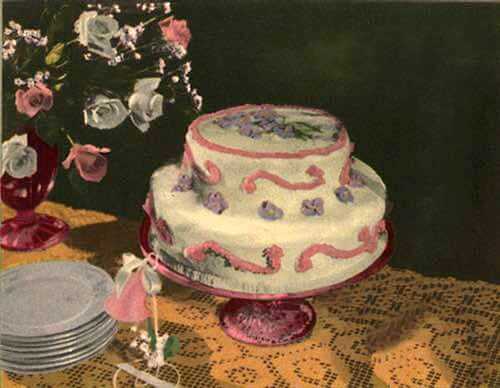 Wedding cakes are traditionally served to wedding guests at a formal reception, or at an intimate wedding breakfast. A white wedding cake recipe typically calls for the finest in lightest-colored ingredients. The white color of the cake symbolizes the purity of marriage, and the joint cutting of the cake by the bride and groom symbolizes their first joint task in married life. The beauty and simplicity of Betty Wilson's famous white cake perfectly complemented the formal White House marriage celebration. 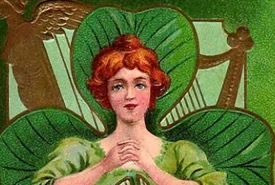 First year, Cotton; 2nd, Paper; 3rd, Leather; 5th, Wooden; 7th, Woolen; 10th Tin; 12th, Linen; 15th, Crystal; 20th, China; 25th, Silver; 30th, Pearl; 40th, Ruby; 50th, Golden; 60th, Diamond; 65th, Blue Sapphire; 70th, Platinum.